Home MMA News Khabib Nurmagomedov Defeats Conor McGregor Via Amazing Rear-Naked Choke! Khabib Nurmagomedov Defeats Conor McGregor Via Amazing Rear-Naked Choke! World Class Submission Victory From Khabib Nurmagomedov Over Conor McGregor! We are live from T-Mobile Arena in Las Vegas, Nevada. The main event of UFC 229 starts! Khabib Nurmagomedov will fight Conor McGregor for the UFC Lightweight title! After the months of the social media war, they are finally coming face to face. The richest UFC fighter fights probably the best cardio machine in the Lightweight division. Stay tuned! Extra security is present here! McGregor drops his hands, lands a left hand. Khabib attacks his legs, Conor’s right leg is in trouble, both fighters are on the ground. McGregor stood up and countered Khabib. But Khabib takes him down! Elbows by Conor. Conor is able to slip one leg. Conor on the cage, Khabib presses him. A strategic battle between these two. Herb Dean warns them. Khabib trapped his legs and he doesn’t let him go. Few punches from Khabib. The crowd starts to boo. Why isn’t Herb Dean doing anything? Conor tries for a guillotine but Khabib goes for a full guard. And a transition to butterfly guard, Khabib passes to half-guard. Punch from Khabib. Conor is completely unable to defend, two punches from Khabib and the end of the round. Khabib dominated. Conor misses with a kick. What a punch and knee by Conor, but miss again. What an overhand right by Khabib, Conor went down. But Conor is in trouble, he misses with an uppercut. Khabib passes to the mount. Khabib misses here, McGregor closed guard and he is in full guard now, which is a better position. McGregor receives a right elbow to the head. Left punch by Khabib. Two left elbows by the Russian. What a ground and pound by Khabib, more than 10 strikes. Conor isn’t even defending here! Is Herb Dean going to stop the fight? So many strikes absorbed. Maybe Khabib goes for the Atlas Kimura. Conor landed a knee to the head, Herb Dean warns him! Conor slips out, but Khabib applies “a knee to the belly”. Guillotine attempt by Khabib. Conor stands up, short knee. The round for Khabib. Conor misses with an uppercut, but good straight. Khabib is a bit tired. Missed right hand by The Russian. Punch to the body Conor. Right low kick Khabib, Khabib misses again with a punch. McGregor defends takedown this time! What a right hand by Khabib. Again Khabib clinches up, but Conor is on the fence. Great defense by The Notorious. Good right uppercut by Conor. High kick miss. Uppercut to the body by Conor. Conor lands punches, he has woken up! Again Khabib tries to clinch up but nothing happens. Good knee by Conor but Khabib survives and clinches up. Another takedown by Khabib, yet Conor is up against the cage. Great left hand Khabib. Herb Dean warns them again. Khabib talks to the referee, the round is over. Conor was holding his gloves. The round for Conor this time. Great left hand by Conor. And a good front kick to the body. Khabib lands a right hand. Conor misses left kick. Good right hand from Russian but ends up on The Irishman’s guard. Awesome trip, Conor is on the cage. And Khabib has his back. Khabib has taken Conor’s back, and The Eagle passes to the mount. It could be an arm triangle. Conor slips out of the mount, returns to half-guard. Good punches from The Russian. Again Khabib has his back. Rear-Naked Choke By Khabib And The Fight Is Over! Herb Dean tells Khabib to step away! What the hell is happening? Khabib stepped out of the octagon to deal Dillon Danis! Conor McGregor was attacked by someone from the crowd! Dillon Danis fights Khabib Nurmagomedov! Is this possible? This is the street fight in the cage! A sad story for the end of UFC 229! 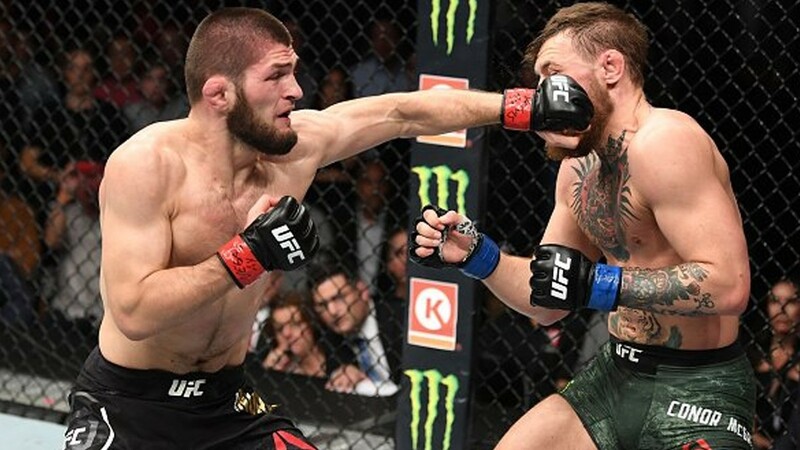 Khabib Nurmagomedov improves his score to 27-0 MMA, 11-0 UFC, Conor McGregor drops to 21-3 MMA, 9-1 UFC.